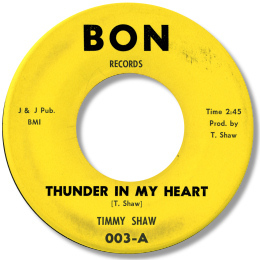 Shaw – whose real name was Jake Hammonds Jr – is now a largely forgotten name even in the obsessive world of Detroit soul collectors. He recorded mainly in the very early 60s and most of his discs, like so many from that era, were spoiled by lightweight pop settings and over enthusiastic female choruses. But his voice was tuff and hard hitting with roots in the R& B world as well as the gospel one. For my money he was the most talented protege that the celebrated Detroit entrepreneur Johnnie Mae Matthews ever cut. Their duet together sadly is forgettable rock and roll, but I’ve always had a soft spot for his minor hit “Gonna Send You Back To Georgia” with it’s “Hi Heel Sneakers” feel and slight air of menace. Wand certainly improved its sales by changing the song tile from “City Slick”! Shaw’s two male duet releases are both worth searching out. “I’m Such A Lonely Guy”, the earlier one with Chuck Holiday, is a chugging mid-tempo tune with very good vocals, but the cut with Little Melvin is superb deep soul. Can’t We Make This Love Last is stripped down so bare – just a guitar, bass and drums – that it could almost be a demo, but I doubt that many scratch vocals generate so much heat and passion. But Shaw’s two solo deep soul rarities are even better. 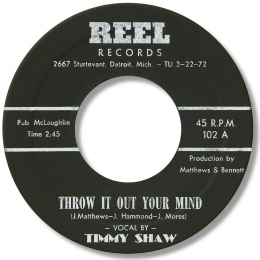 Throw It Out Your Mind is a cross between a religious revival song and a doo-wop featurette as Shaw appeals to the Almighty to help him out. You can picture him on his knees as he simply screams out the lyrics. A stunning disc. But even this can’t compete with Thunder In My Heart. Over a superbly judged bluesy guitar and piano, Shaw almost knocks himself out - howling out his despair like a man possessed. There's a backing group of vocalists in there somewhere as well, but they're quite overwhelmed by his power. And what about the dead stop finish - extraordinary! 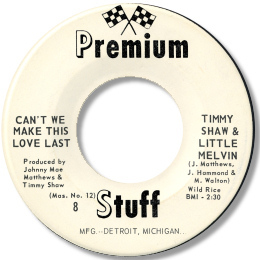 This remains one of the most sought after deep soul 45s, and no wonder. They simply don't come much better than this. Timmy Shaw passed on in 29 March 1983. Thanks to my friend Greg Burgess for extra info.